Click for more data on Google. Google shares soared above $1,000 a share early Friday as investors cheered the company's latest quarterly report. The stock surged nearly 14% to end at $1,011.41 a share, well above Google's previous all-time high of $928 set in July. Late Thursday, Google (GOOG) reported earnings and revenue that blew past investors' expectations, driven by strength in the company's core search business. 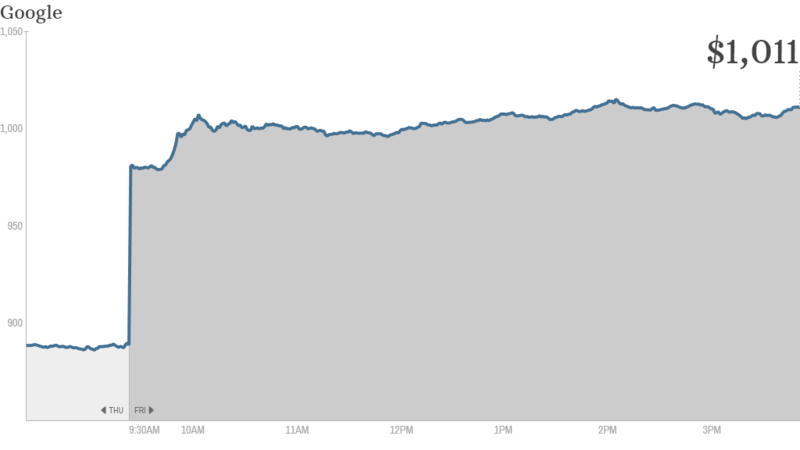 The stock could head even higher, according to a raft of analyst reports published Friday. Deutsche Bank was one of the most bullish, raising its price target for Google to $1,220 from $970. Credit Suisse hiked its price target to $1,200 and Jefferies now thinks Google can hit $1,150 at some point over the next year. Shares of Google are now up more than 40% this year. Amazingly enough, the stock has lagged the performance of two key rivals in 2013: Yahoo (YHOO) is up nearly 70% while Facebook (FB) has more than doubled. Google is the second blue chip tech company to recently top $1,000 a share. Online travel site Priceline (PCLN) became the first S&P 500 company to hit a four-digit stock price last month. Its stock is currently hovering around $1,050. At $1,000 a share, Google is trading at about 19 times 2014 earnings estimates. But those estimates are likely to be raised in light of the company's recent results. Deutsche Bank, for example, hiked their full-year earnings outlook to $54.30 a share. The current consensus is for Google to earn about $51 a share. By comparison, Yahoo currently trades at nearly 20 times next year's earnings estimates, even though it's still a turnaround story. Facebook, which is growing more rapidly than Google, is trading at nearly 55 times earnings forecasts for 2014. Analysts pointed to a number of factors behind their rosy outlook, including revenue from Google's "enhanced campaigns," which help marketers more easily run targeted ads on both desktop and mobile. YouTube in particular is expected to benefit from a shift in ad dollars away from traditional television. Google is not alone in its quest to make more money off of mobile advertising. It's a main focus for Yahoo and Facebook as well. And Twitter, which will soon go public, is expected to be a force to be reckoned with in mobile ad sales too. Still, even though mobile Internet usage continues to grow, advertisers won't pay as much for mobile ads as they do for desktop ones. So even as the number of ads clicked on Google properties increases, the company is commanding less money on average for each of those clicks. Google is also facing challenges in its Motorola business, which lost $248 million in the third quarter. But analysts seem to believe that Google's dominance of search and its established advertising business give it an advantage over rivals. Google should also benefit next year from expanding profit margins. -- CNNMoney's Julianne Pepitone contributed to this report.